With two children learning the keyboard, my interest in playing the piano was re-ignited (from some 35 years ago!). 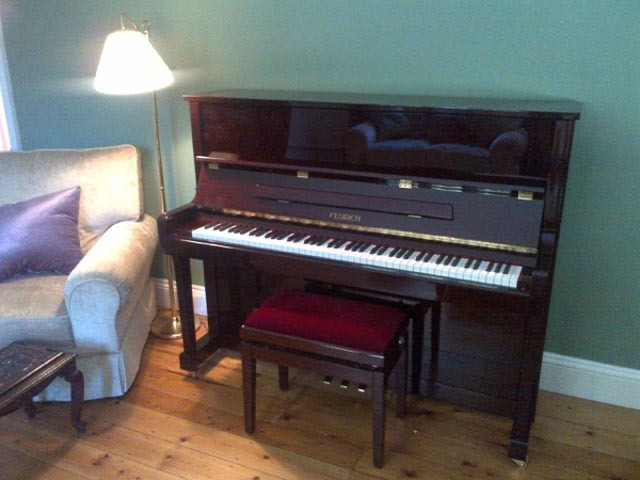 Having found a fabulous piano teacher, I was encouraged to buy a piano. Ben Wheeler came highly recommended not just from my piano teacher but also a number of others in our village who had received great service from him. There is a reason for this praise – his knowledge is outstanding. He patiently detailed with such enthusiasm the differences between each of the pianos and allowed me as much time as I wanted to play any of the instruments in his showroom. No pressure or steering was applied and no time limit on my decision making was implemented. We now have a piano that we love and a piano that has become a huge part of our life. It has brought life to our living room. Our Feurich not only looks beautiful but sounds wonderful. Thank you!